"Partial migration"—where some individuals within a population migrate and some don't—is common among birds and is speculated to be a step on the evolutionary path to complete, long-distance migration, but scientists know very little about how it actually works. A new study from The Auk: Ornithological Advances tracks where American Crows go during the winter and shows that while individuals are consistent in whether they migrate or stay put, partial migration might give them enough flexibility to adapt to changing environmental conditions. 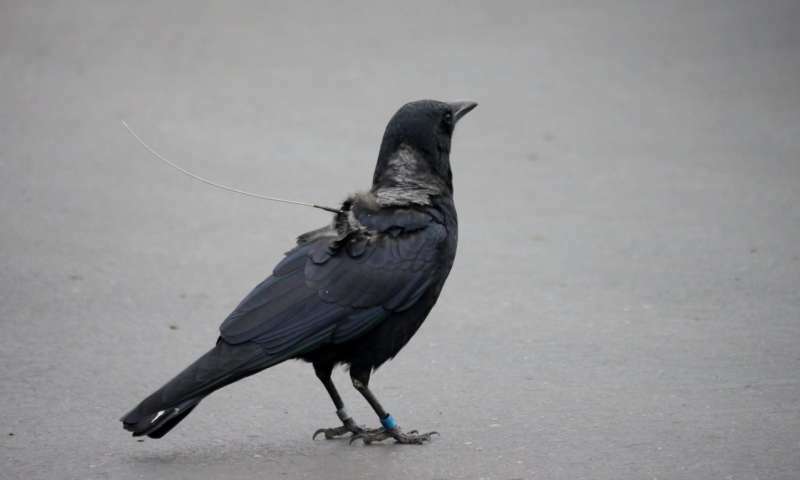 Hamilton College's Andrea Townsend and her colleagues captured crows in large winter flocks in Utica, New York, and Davis, California, fitting them with satellite transmitters to track their movements and collecting blood and feather samples. Their data show that 73% of western crows and 86% of eastern crows migrated at least some distance to breed, with an average journey of around 500 kilometers. Birds returned faithfully to the same breeding territory each year, and whether or not individuals migrated was consistent from one year to the next—they didn't switch strategies depending on environmental conditions. However, they were flexible in where they spent the winter. This information can serve as an important baseline for tracking how crows' migratory behavior is affected by factors including climate change and urbanization. Urban "heat islands," as well as general warming trends, could lead more birds to shorten their migration and spend the winter closer to their breeding territory. "If you live in a place, usually a city, with a huge winter flock of crows, you are seeing migratory birds that came south for the winter as well as your local, year-round crows," says Townsend. "Personally, I find the sight of an 8000-crow roost exhilarating, but if they or their feces are driving you crazy, you can at least take comfort in knowing that most of them will disappear in early March." "It is surprising how much remains unknown about the seasonal movements of most partial migrant species, and this is especially true for variability among populations," adds the Smithsonian Migratory Bird Center's Emily Cohen, an expert on migration patterns who was not involved with the study. "This kind of information about populations-specific annual movements is not trivial to collect, but is fundamental to understanding most aspects of the evolution and ecology of species." Crowds of crows spread C. jejuni: Are humans vulnerable?